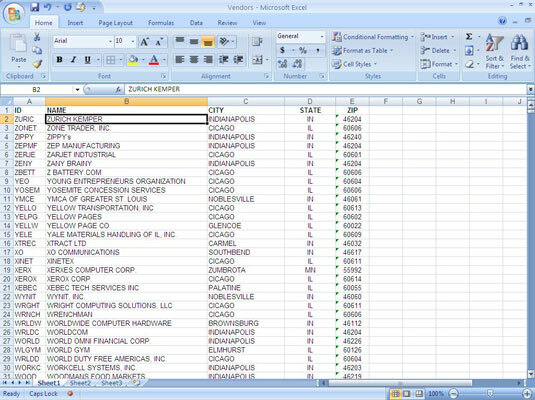 You may find data in an Excel 2007 worksheet easier to view if it’s sorted on a particular column, in ascending or descending order. Excel sorts in the following pattern: numbers, spaces, special characters (such as ! “ # $ % & * < = >) and finally, alphabetic letters. Sorting data in ascending order sorts text from A to Z; numeric information from low to high; and dates with the earliest date first. Sorting data in descending order sorts text from Z to A; numeric information from high to low; and dates with the most recent date first. 1Create a contiguous list with headings specifying the contents of each column. For the easiest sorting, there should be no blank rows or columns in the list. 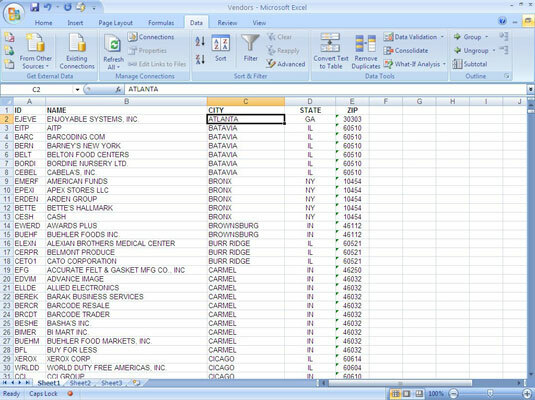 2In the column you want to sort by, click any cell containing data. If the data isn’t in a contiguous list, you must first select the entire list. If Excel finds unselected data in columns next to the selected data, it may prompt you for more information. 3Click the Sort A to Z button in the Sort & Filter group on the Data tab. If the current cell contains a value, the button says Sort Smallest to Largest. If the cell contains a date, the button states Sort Oldest to Newest. Excel sorts the entire list in ascending order on the specified column. 4Click the Sort Z to A button in the Sort & Filter group on the Data tab. Excel sorts the entire list by descending order on the current column. If Excel incorrectly sorts a cell that contains a value, make sure the cell is formatted as a number and not as text.